Your head remains dry inside the helmet, you can even wear your glasses. You remain in total security just a few seconds below the surface. A Taxi boat will come to pick you up from the dock and will take you to a comfortable motorized catamaran where your instructor will explain the basic safety measures and diving signs. Plastic shoes, wetsuit, mask and snorkel are available as there will be time for snorkeling while others are taking their Agua Safari as group size is limited. A certified diving instructor will help you put on the helmet and descend the ladder into the crystalline waters for your 30 minute underwater experience. Walk on the sand among interesting coral formations while surrounded by tropical fish in a myriad of beautiful colors. If you wish you can have fish eating right out of your hand. All too soon, it will be time to return to the boat via the ladder where water and orange juice will be awaiting you. 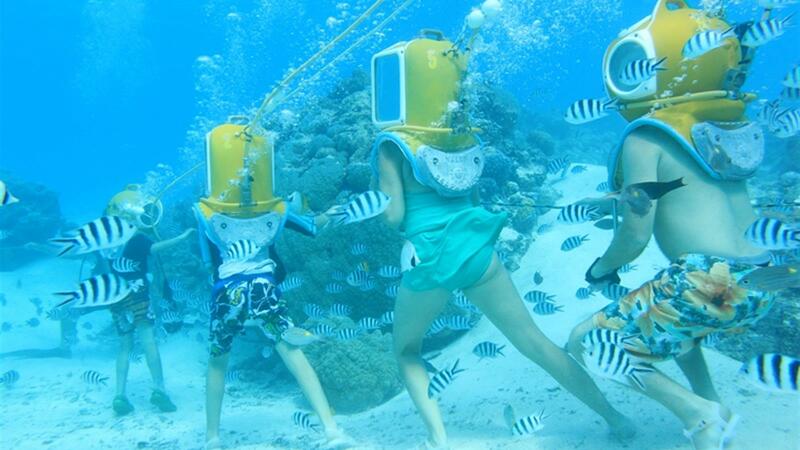 You may snorkel while others are on their walk. Return directly to the pier via water taxi at the conclusion of your tour.